This book is so, so good. Not only does it offer the sordid and egregious details of some of our recent presidents, but it shows the tender moments, too. Author Ronald Kessler knows his stuff! 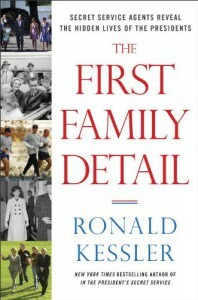 In this, THE FIRST FAMILY DETAIL, he blends all his research and interviews together to make an interesting, page-turning book. I could NOT put it down! What kept me pulled into this book was Kessler’s gradual introduction into another world. Chapter-by-chapter he would present new terms (such as “the beast”, “the jackal”, and all the presidents’ code names: Timberwolf, Eagle, Searchlight, Passkey, Renegade, etc.) and he would describe security protocol (how many people are required to travel internationally, the fade-away tape used in processions, the actual protocol for “the football”, etc.). All the outrageous moments from the back of the book are here: actor Bradley Cooper getting a “free pass” through security, Biden’s $12,406 gulf trips, and Clinton’s current mistress (code named Energizer). There are plenty of other outrageous moments: which presidents slept around, which ones peed in the open in front of press and staff, which ones shunned security. I appreciated seeing the kind moments, too. Like Barbara Bush ensuring a 40-year-old agent had a hat while on the cold beach. Or, the Obamas serving agents chili during the Super Bowl. It all comes together to paint an interesting, inside-scoop picture of the presidency and their protection. Kessler doesn’t appear politically aimed in any of this writing. We see both sides of Republicans and Democrats alike. Sure, there may be some noticeable patterns, but both parties have their heroes and their heretics. No matter how you cut it, this book is a highly entertaining and interesting read. Thank you to Crown Forum for sending me this book through Blogging for Books for review.